I'm flattened and thrashing on the sun-warmed track next to the football field lying on what looks like asphalt but I realise now that I'm down here, is actually that fake spongy stuff. It reeks like it was just installed. There's a woman kneeling beside my right shoulder shouting into a cell phone. A secret government agency has developed a drug called Revive that can bring people back from the dead, and Daisy Appleby, a test subject, has been Revived five times in fifteen years. Daisy takes extraordinary risks, knowing that she can beat death, but each new death also means a new name, a new city, and a new life. When she meets Matt McKean, Daisy begins to question the moral implications of Revive, and as she discovers the agency's true goals, she realises she's at the centre of something much larger — and more sinister — than she ever imagined. OMG! I absolutely loved this book. I really enjoyed Cat Patrick's first book FORGOTTEN, but REVIVED I adored. From the first chapter I was completely ensnared and struggled to put the book down until the end. The drama and tension had me quickly turning the pages to find out what would happen. This has got to be one of the most addictive reads I have read this summer; the type of book that makes you want to read more. The story had the feel of the Pittacus Lore books yet with more girl power - Daisy continually has to move around every time she dies as she needs to have a new identity, just as Six moved around to reduce the chance of discovery. You cannot help but feel sorry for Daisy as all she wants is a normal life where she can make friends and settle down, yet unlike the rest of the kids who died with her on the bus and were brought back to life, Daisy seems to make a habit of dying. She is allergic to bee stings and needs to carry an Epipen, yet she still struggles to keep alive. On reaching Omaha, Daisy is determined that this time her life will be different and she befriends Audrey. I loved Audrey, she was one of my favourite characters in the book and really touched my heart. She kept going regardless of what happened to her. She was truly inspirational. Cat Patrick is fast becoming a favourite author of mine as she easily writes believable romantic situations which have you swooning. Matt is simply hot and the type of boy you dreamt of going out with at college. I loved the whole concept of this story - the plot was brilliant and addictive. The characters were very well written and the story stayed with me long after I had finished reading it. It is one of the books I wish I could have written myself. Cat Patrick officially blew my brains with this mind boggling plot and left me wanting more. I really hope there is a sequel to this book. 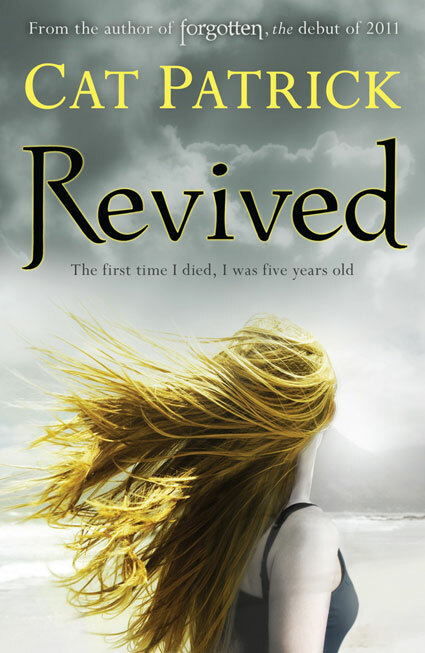 I can't wait to read Revived! I also loved Forgotten :). Thanks for the great review! Sounds like a fascinating read though I'm presuming it could be a little bit dark. As always a great review, thanks. Whoa. How did I not hear about this book before?! It looks really dark and interesting - and I like the fact that it's a well-executed idea as well, with good writing and characters. I was a bit disappointed and thought it didn't live up to Forgotten. Agree though Audrey was sweet! This does have an exciting premise! I'm glad you found this one addictive and brilliant. Wow Viv, it sounds great! I like the cover. great review viv, I loved this one too and think we really should post a petition to get a sequel!